The first tree to begin a color change is in my neighbor’s yard. I notice is as I walk. I love trees, and I’m still planting them. At my age, I know there is a chance they will not mature into their full height before I am gone, gone from this house or gone from this earth. Still I plant. Just this week, I planted five little saplings, weeping willows and curly willows I started from cut branches. They have been happily growing in a pot by the walkway until this fall season when I hoped we might get steady rain. With the dry summer heat predicted for the next couple of weeks, I’ll be carrying water all over the yard. I have planted a number of the trees during the time we have lived here. I’ve watched them grow, and now I enjoy walking among them. One dear to my heart is a 22-year-old Bradford Pear. It has lived its lifespan. I read that it is not a favorite tree anymore because of the shortness of its life. Yet it grows bountifully here. We planted it at the gravesite of our beloved poodle-mix dog who lived to be 18 years old. She was the pup our son grew up with. She died the year he married. The tree is as old as his wedding anniversary date. It blooms beautifully in the spring, spreads its arms wide in the summer, and rewards us with golden-red leaves in fall. Two oaks on either side of the yard were grown from tiny seedlings. There are others the squirrels planted. They stand tall and straight, established and stable. Some of my trees were nature planted. Thank you, sweet birds. Then there’s a crooked little apple tree close to the lane that bears small tart apples in a good season. Years ago my dad noticed it sprouting up in the lawn and protected it from the mower. Perhaps it started from a tossed apple core. I trimmed it this week, its branches sprawling in a unique formation. I think of my dad and how he loved all things green. As the seasons change and leaves fall, I discover bird nests in the forks of branches. Environmentalists say trees encourage wildlife on the property, offering food, shelter and a place to build a home. The trees are my offering to them. There is something comforting when I walk among the trees. I especially like to walk under them, in the shelter of their branches. When Maisie and I take our daily walks down our lane, we pass a group of tall oaks growing on the edge of the little woods. We’ve stopped there when it was raining and been protected from the downpour. In the heat of summer evenings, I’ve felt the coolness drift toward us in that particular spot, the green leaf covering changing the temperature ever so slightly. It catches me off guard, a curiosity I stop to enjoy. My friends have come from varied places and in different ways, some in the form of family members and others randomly placed in life’s pathway. Relationships formed by what seemed like an accidental meeting. Other times the friendship developed as the result of being sought out and purposely planted. I’ve found friends at school, in neighborhoods, at church, in the community. These are people I treasure and are as varied as the shapes and fruit on my trees. And I love them for their unique qualities and how they enrich the soil of my soul. They shelter me, these friends of mine. I find consolation from their presence and our conversations. They offer encouragement when I need it. Their words are honest. Their hearts are true. Their prayers strengthen me. Their love makes me a better person. In the beginning, the Lord God planted a garden. He called it Eden. While Eden is no longer, there is still a garden where friendship flourishes. A relational God created us for relationships. We desire it, crave it, need it. It is His gift to us. Friendship takes effort. It takes time. It takes investment. It requires nurturing. If neglected, it can flounder and we will find ourselves lost without it. Cherish the people God brings into your life. They are more important than jobs or possessions or bank accounts. God has planted eternity in the human heart. As we honor our people, we find them to be our wealth, the true and lasting riches we long for. 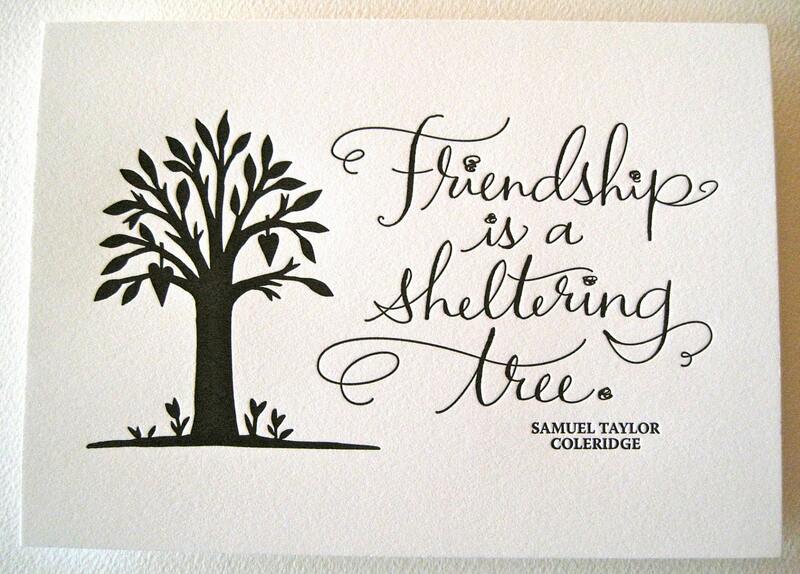 Friendship is a sheltering tree. Hold dear your friends. And be a shelter to someone else. He will continue to astound mankind. He has given us great and precious promises. He will fulfill each one in the fullness of His time. The earth declares Him, in the smallest arthropod and the grandest nova. We see Him in an infant’s smile and the aged’s wrinkled expression. The heaven of heavens shout His existence, the thunder resounds His awesome power, the lightning flashes His majesty. To God be the glory! Let us give Him praise!